SCOTTSDALE, Ariz.—Dr. 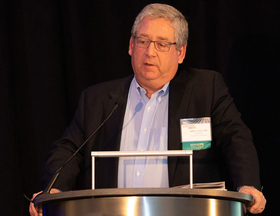 Jeffrey Cohen is typically one to shy away from praise, but to many of his colleagues gathered in Scottsdale for Modern Healthcare’s Leadership Symposium, he is a hero. Cohen didn’t dwell on the shooting in his remarks, rather he reinforced themes from the 1½-day conference—resilience, empathy, collaboration, culture, courage and continuity. Healthcare leaders expressed the importance of transparency, integrity and cooperation between former competitors amid adversity and disruption. They explored how to maintain a balance between margin and mission. They looked at the shifting political and reimbursement landscape and how new partnerships can help them weather those changes. Leaders also discussed how to deploy resources more effectively to stem diseases and how to imbue staff with the power to spearhead that change.